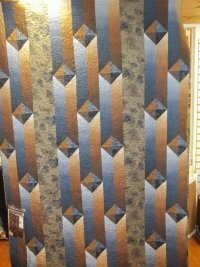 Last Chance for Bus Hop & New Quilt! Want to spend 2 days making new friends, eating and visiting quilt shops? Join us on our Fall Bus Hop October 17 & 18! We will be going via motor coach to Yellow Creek Quilt Designs, Freeport-Quilter's Quest in Chicago suburbs, The Village Stitchery in Oblong, The Back Door in Indianapolis, Threads of Time in Danville, Quilter's General Store in Rockford, Prairie Stitches in Oswego and of course Quilter's Garden. The cost is just $149 and it includes your comfortable coach ride, lodging and all of your meals and snacks for 2 days. What a deal! Grab a quilting friend and give us a call--815-879-3739. Check out our new quilt, Gentleman's Agreement. It includes ombre fabric that makes it look like it shines. Oh, we even have a kit available! A perfect quilt for the favorite man in your life. We put Shannon on the back and it is soooo soft!